New Scotland Ave and Buckingham Drive at midday. Taxes, the budget, crime and policing -- they're all important topics that frequently come up for discussion in the city of Albany. 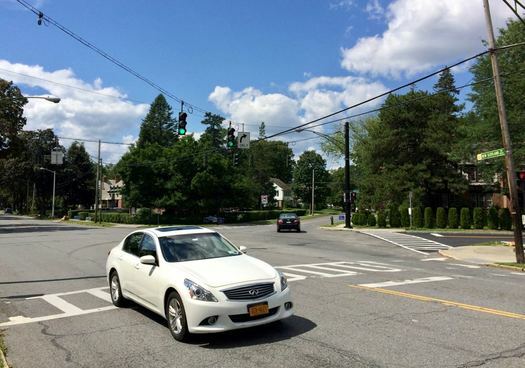 But if we had to guess the topic that bubbles up most often in the most places -- public meetings, neighborhood associations, online comments -- it would be this: The idea that people drive too fast and too recklessly through Albany. On Wednesday the city announced that St. Peter's Health Partners is putting up $100k for a traffic study of the busy New Scotland Ave corridor. People who live along the corridor say it feels like traffic volumes are up significantly in recent years and that's led to congested, unsafe streets. And while the study will just focus on this one section of the city, the situation touches on bunch of issues and challenges that are facing all of Albany. There aren't a lot of details yet on what exactly the New Scotland Ave traffic study will involve. Wednesday's announcement centered on the fact that 1) the city is planning to do this and 2) St. Peter's is putting up the money for it. The New Scotland/Buckingham/Krumkill has become a hot spot for traffic safety concerns because it represents for one of the main "valves" for commuters to flow in and out of the city each day because of its connection to Route 85 (and then onto I-90) There is also the sense among many people in the neighborhood that volume is also up. "We have seen a significant increase in traffic," said mayor Kathy Sheehan, echoing many comments from residents at meetings of the Buckingham Lake Neighborhood Association. Over the last year or so the city has experimented with a handful of small interventions to slow down the traffic and divert it away from side streets. A new stop sign on Buckingham Drive. Changing a couple of streets between Buckingham and Krumkill to one-way. A new left turn signal on New Scotland. They have had what appears to be a marginal overall effect -- and in the case of the one-way streets, they've aggravated some residents. "I am keenly aware that nobody's happy," Sheehan said, acknowledging the need for a larger, systematic approach. "We've gotta look at this, we have to be transparent about it, and we have to talk about what the options are." Zooming out from this spot a bit, the situation highlights one of the major challenges that faces the city of Albany: Every week day a huge tide of commuters sweeps into the city in the morning and then drains back out in the late afternoon. Census data indicates the population of Albany swells by some 65,000 people each day -- an increase of 67 percent -- because of commuting. No other place in the Capital Region experiences a daily flow of such magnitude. That daily flow presents a range of challenges to the city, first and foremost that its infrastructure has able to handle the resulting traffic. And it has to find a way to pay for it while it watches the income earned in the city by those 65,000 jobs stream out to other municipalities. The balancing of costs is made even harder by the fact that many of the many of the institutions generating (often high paying) jobs in the city largely don't pay property taxes: state government, hospitals, and colleges. "We want to continue to grow jobs in this region," Sheehan said Wednesday. "And we need to understand what the consequences are of that and how we can deal with those issues in a productive and effective way that keeps in mind the people who are living in the neighborhood." St. Peter's employs a little more than 4,000 people at its hospital campus at New Scotland and Manning Boulevard, according to spokesman Elmer Streeter. He said the expansion there over the last decade has resulted in a net increase of about 500 jobs. 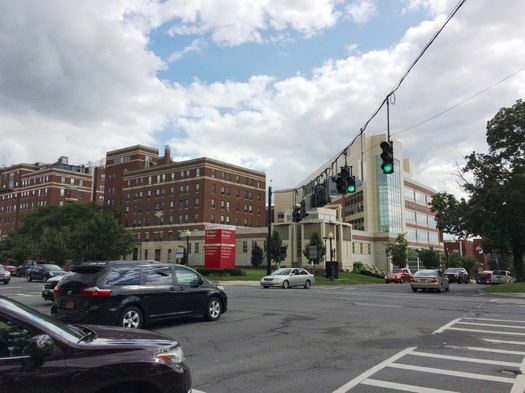 So St. Peter's is contributing to the traffic in the corridor -- and St. Peter's CEO Virginia Golden said the hospital expects to be "an active participant" in the process surrounding the traffic study -- but it's only one chunk of it. And there are plenty of job centers farther upstream, stretching to the area around Albany Med, that contribute to the flows. It will be important to get those institutions involved in working the problem, too. City officials said Wednesday they're keeping an open mind about what sorts of fixes the New Scotland traffic study might propose. But one of the goals will be to find ways to just get people to drive more slowly. "How do we get people to go the speed limit? What can we do with respect to our traffic patterns so that we discourage people from flying through here?" Sheehan said. "Because right now for many stretches of New Scotland Avenue, and I see it all the time, people treat it as a speedway." Dan Sleasman is the president of the Buckingham Lake Neighborhood Association, for which traffic safety has been a persistent concern. Over the long term he said he'd like to see the city find a way to channel the commuting traffic to Route 85 so that it doesn't travel on so many residential streets. But he acknowledges that sort of fix -- which could potentially involve some sort of new connection to 85 -- is expensive and a long way off. So, in the short term, he'd like to see the city drop its speed limit on most streets to 25 miles per hour. "Right now, the citywide speed limit is 30 miles per hour. But in reality motorists are allowed to drive up to 40 miles an hour without fear of ticketing because of the way it's enforced. And 30 is too fast for many parts of the city," Sleasman said. "If we can lower the speed limit from 30 to 25 mph, and get the police department to consistently enforce a maximum of 30 through the city, it will be a game changer for residents. It will improve safety for cars and pedestrians. And it will significantly improve the quality of life for residents of these busy areas." The city recently took a small step on the speed limit issue when it the lowered of the limit to 25 along a stretch of South Pearl Street (there's a truck traffic study in progress there). With the persistence of traffic safety as an issue of discussion, it's worth watching whether support gathers to change the limit for the whole city. It's not a big mystery to me why traffic law compliance in Albany is non-existent. There is virtually no enforcement, except occasionally in the western part of the city. In 18 years of working downtown and 11 years living on Delaware Ave.,I could count on one hand the number of times I have seen Albany PD doing traffic enforcement in those areas. The City of Albany is complicit in the many accidents and fatalities that have taken place on New Scotalnd Ave from Manning Blvd to Whitehall Rd. That stretch of road is ONE LANE. The sections that are four lanes are marked by lane markers and exist only on the approaches to Krunkill Rd, Buckingham Dr and Manning Blvd. The city has turned it's head while that stretch gets treated by nearly all as a four lane highway. CDTA buses, ditto. In the future, If at all possible, all traffic to and from route 85 should all be diverted to Krumkill Rd. "... like to see the city drop its speed limit on most streets to 25 miles per hour." This has become such a nonsense phrase to me. Washington Park was reduced to 20mph more than a year ago & nobody goes through there that slowly unless they are trying to park. All of our school zones are 20mph with flashing signs telling people they are going 32, 37, 43mph (not making those numbers up). You cannot just change signage- we've already done that & it doesn't work. ethan - true problem is that old infrastructure is unable to handle modern challenges, and we have no money to invest into the problem.. That can be said not only about roads, but about water lines, drain, power distribution... I don't know if there is any hope here - it is too expensive and there is no coherent approach to such problems anyway. So a bit of duck tape, fresh paint - and it looks like new! Sounds like CDTA's Universal Access program would be a good fit for St. Peter's Hospital. I wonder how their program with Albany Med is going and if there are any lessons learned there that can be applied to this study. Changing signage alone to drop the speed limit won't work. If the street looks and feels like it was designed for 40mph, people will go 40 no matter the posted limit. Cops can't be there all the time, and the reaction to red light cameras in the city tells me people won't accept automated speed enforcement. Street calming, complete streets, or some other road design must be included to actually get people to slow down. I don't think there will be any answers in this study. Any possible rerouting of traffic still leads to residential areas. A lot of this traffic is heading down to Albany Med as well. There really aren't a lot of options when you do huge expansions on major hospitals. Maybe turn the old Blue Cross building out on New Scotland into parking and shuttle people in? Traffic calming measures would also be very helpful in this corridor and should take into account the traffic backups due to poorly timed multiple stop lights in preceding sections of the road. I believe there are far too many stop lights further back on New Scotland (from Academy to S. Main), in particular the one at Ragonese (NSES and the Bach Library lights make sense). Then after the inevitable traffic jam on the next stretch from S. Main to S. Manning on New Scotland, drivers are so frustrated that I have seen them accelerate to get through the next stretch of open road. Better lane striping in the traffic study section on New Scotland would clarify that the road is one lane each direction and could provide dedicated bike and parking lanes. This would also help with calming traffic. The only guaranteed way to reduce or limit commuters driving downtown during weekdays is to raise parking rates (or parking taxes if private lots won't raise prices) to a point that enough people will choose an alternative like public transit or shuttle lots. That's what the study should study: what would commuter habits be for $12/day parking? How about $15? $20? Any additional funds from the rate increase could be dedicated solely to traffic improvements. My issue is Tampa Ave and Frieble Rd being one way streets in the same direction. I've spoken to multiple officials and no one can give me any reason why this is the case. Could I please get to my neighborhood when coming from Rt 85 exiting at Krumkill? I don't want to get rerouted to New Scotland Ave and make a full circle just to get back down Buckingham Dr. As it stands now Frieble Rd still gets a lot of traffic but Tampa Ave is primarily a private street used only by the residents who live on Tampa. Just doesn't seem fair to me. Every street in our neighborhood should have to bear some burden regarding the traffic. If speeding is an issue on either side street, and I'm sure it is, I agree that the police should be placed there to enforce the speed limit. More potholes might slow cars down . . . plus more tickets if the main issue is traffic going too fast. To reduce volume, how about employers offer transit assistance for using public transportation? Or arrange carpools? Or offer bus or van rides from areas in which many employees come? (What percentage of cars at rush hour have one lone person in them? I bet a huge percentage.) Or offer some incentive for those who bicycle to work? I realize the distance one can reasonably cycle to work is limited, and there are inherent problems such as winter winds and snow. I lived downstate for many years. While I would agree that people in Albany zoom through Washington Park, among other places, generally drivers are reasonably polite to one another as well as to pedestrians. I don't quite see what the complaining is about. Albany is a city, and it has jobs. It does not have a train station or a network of regional trains. Overall, the regional transit system is weak, so people are going to drive until there is a better wayâ€”or their solo commute by car is miserable and/or very expensive. As a comparison, the population of White Plains in Westchester County increases almost 3.5 times during regular work hours (per a 2015 article in the New York Times): "According to the office of Mayor Thomas M. Roach, the cityâ€™s population of 58,000 swells to 200,000 during the day with county workers and employees of businesses like Pace Law School and Bank of New York Mellon." I've also seen 225,000 published as the White Plains daytime population. So, hey, things could be worse in Albany! I agree with Joe above. What is wrong with this city, they just have up trying to figure out what to do with that would stretch. It's a free for all. Hi all, I feel that every road in NY is a speed way. Especially on 90, 88 and such. I call the people who put the "pedal to the metal" Dale Earnhardt's, Evil Kinevil's and Ricky Bobby's (shake n' bake lol). I think having speed traps all along interstates, city streets and the back roads will definitely be a deterrent against the speeders who break the law! No one seems to think about traveling at that rate of speed takes almost half the length of a football field to come to complete stop. Very dangerous, and also sad. When I first moved here, I couldn't believe how bad the traffic infrastructure was. The way the intersections, medians, and lights are set up here increase stress, aggravation, and road rage. Some fixes could include: (1) put a 3-second pause in after a light turns red before the next one turns green, (2) speed tables and flashing pedestrian crossing signs between intersections, (3) center turn lanes and median barriers, (4) sync up the lights so that people don't sit through multiple cycles of the same light, (5) increase the number of left turn lights, but make them "smart" so that they adjust to the flow of traffic, (6) police enforcement, particularly for running lights or turning left without the right of way. I cannot even tell you how much easier it was to be a commuter in WNY, where roads make sense and the only time you have to sit through a green light is when there's a massive accident. Anyone who thinks making life miserable for someone else, should remember that state population is declining, and cities in the area are balancing around zero growth, mostly on red side of it. Do you think that making life worse for someone else would improve anything in grand scheme of things? Recommendation: 25 mph speed limit: solves everything! Tram or train -- need a mass transit option to reduce the number of cars not the speed limit. Please stop with the busses all it does is get in the way and create more traffic. @JC the economic incentive should be first and foremost here. With a rising population, it's simply not feasible for every employee to drive a personal car from their home outside of the city to their workplace every day. Increase parking fees/taxes. Offer incentives for shuttle usage and CDTA usage. Places like Empire State Plaza get employees to use shuttles and buses because there is simply no other option - parking is very limited. The article makes this good point - Albany's tax base is hardly bolstered by the good-paying jobs that St. Peter's provides. People can complain about road infrastructure all they want, but if you don't live in Albany you probably aren't contributing much to it. I will certainly agree that striping MUST be enhanced for New Scotland. I should never have to "guess" how many lanes there are. What seems to always get lost in these conversations is that the corridors in questions weren't designed for the volume of traffic going to St. Peter's and Albany Med today. They were designed in an era when those facilities were smaller. Additionally, you're asking the city to make changes to support facilities that don't pay taxes, so it's really a double edged sword. I'm not saying nothing should be done, but this is what needs to be kept in mind. If changes need to be made St. Peter's and/or Albany Med. should be asked to foot some of the bill because they are the cost causers in the end. This study has been a long time coming and I look forward to the public input process. The study should really focus on the neighborhood because many side streets feed into New Scotland and speeding is rampant. 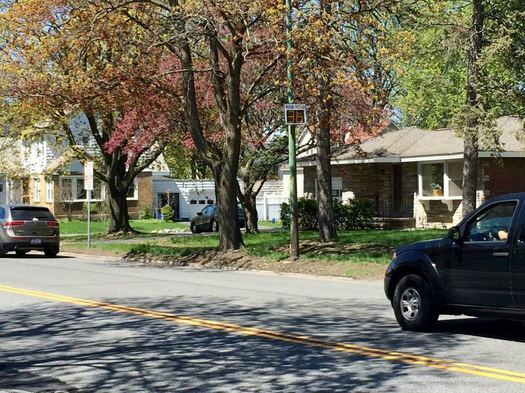 The solution is drastic, but fairly easy to implement IF the goal is to shunt all non-local traffic out of the Buckingham neighborhood and off of Buckingham Lane, and onto Krumkill Road. Keep Friebel a one way as it is now. Restore Tampa to a two way street, but put a stop light at the end with a punitively long left-turn signal. This would allow traffic flowing into the Buckingham Lane area to make a right on red, but 'train' drivers not to cut through on Tampa to get onto 85 because of that long left turn red arrow. Finally, but a barrier up at the intersection of Buckingham, New Scotland and Lenox, such that traffic would not be allowed to turn off New Scotland onto Buckingham. Make Buckingham a one-way toward New Scotland from Holmes Dale to New Scotland. This would allow Buckingham residents to make a turn onto New Scotland from either direction. Hey R i bet you live on friebel why should friebel not turn in to a two way?its less dense then tampa or turn friebel the other direction. And for disclosure i do not live on tampa. Any update on this study? Or did it get filed in a trash can?